Automobile accidents can cause extensive suffering and loss to motorists, passengers, and pedestrians. Injured victims face medical bills, lost wages, pain, suffering, and loss of enjoyment of life. Family members may suffer economic loss, mental anguish, and loss of companionship. Regardless of who was at fault in the accident, victims should seek the counsel of an attorney. At Wellens & Jablon, LLC, an experienced attorney will review your case at no charge. If you retain us, we will promptly investigate the accident, determine fault, and seek to recover all legal damages. File a report with the police, sheriff or highway patrol. Obtain the name, address, insurance information, vehicle license number, and driver’s license number of all persons involved in the accident. Obtain names, addresses, and telephone numbers of all witnesses. 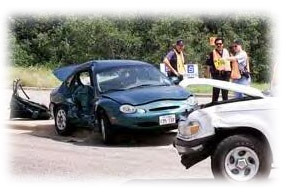 Photograph the accident scene, all vehicles involved before repair, and any visible injuries. Do not talk to anyone other than a lawyer and doctor about the accident and injuries, especially do not talk to an insurance adjuster without consulting a lawyer. The insurance adjuster is not employed to protect your interest and can drastically undervalue and ignore your claims. Do not sign anything without consulting a lawyer. Seek prompt medical attention and describe all symptoms and complaints.